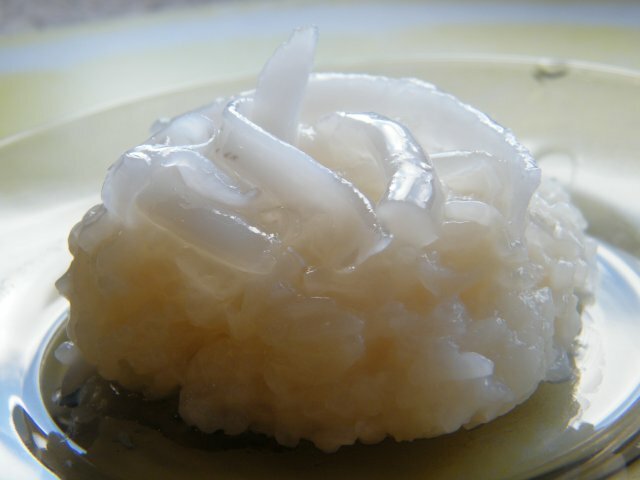 My wife was saying how her Inay makes the most wonderful sinukmani during All Soul's Day (much like my Nanay makes her famous suman on this special occasion too). Luckily, Inay is here with us currently and so we requested her to make Sinukmani! While she was busy preparing the glutinous rice, I asked what the procedure will be. And when she had done so, I remarked "oh, it's similar to Bico (also spelled Biko)." "It is called Biko in the northern region of the Philippines," she said. "We call it Sinukmani in the Southern Tagalog regions." I learned something new! And since I said so many posts ago that I was going to share a recipe for Biko (which I know now is also called Sinukmani), here it is! 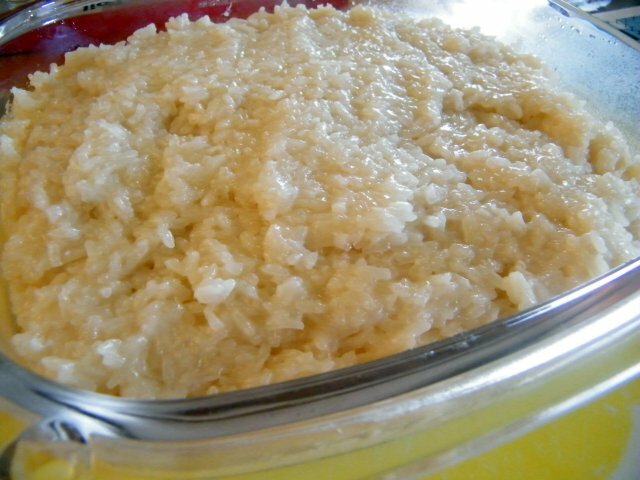 Traditionally, the glutinous rice takes on a brownish colour because of the Palm Sugar used. But in this case, our palm sugar is a bit on the pale brown side and so the rice still retained its glorious white. Also, a sweet, brown topping is traditionally placed on top. 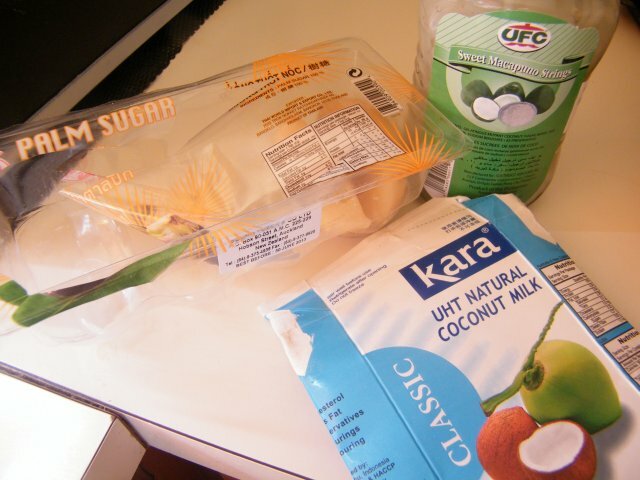 But we ran out of ingredients and so we used sweetened coconut strings instead, which also worked well. Perhaps I will add the recipe on how to make the traditional topping when we get to do it. In the meantime, coconut strings is a nice touch for when you are stretch for time, or stretched for ingredients! If you can buy palm sugar of a darker colour, but that as it will give a nice colour to the rice and contrast with the coconut strings. 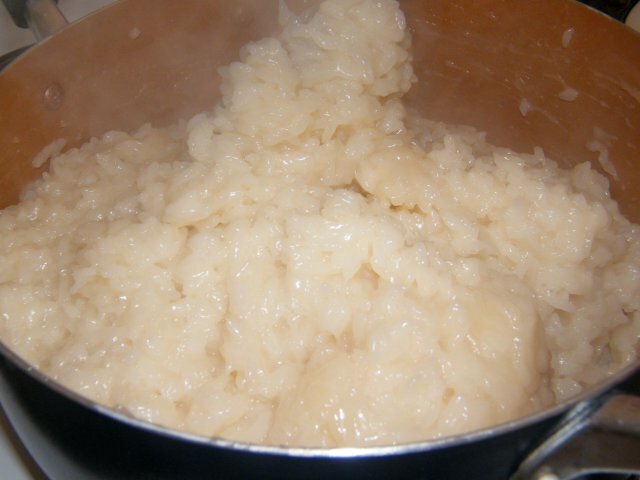 Use a pot that's a little over twice the level of the rice. Wash the rice once. Then fill the pot with water, with about half the level as the rice. We usually do this with our hand. Just dip your hand into the rice, touching the bottom. Use your thumb to note where the rice level is. Then bring your hand up and measure from the top of the rice level to check the water height. Add or remove water as necessary. Cook over medium heat. In a rice cooker, you just switch it on and leave it til it gets cooked. 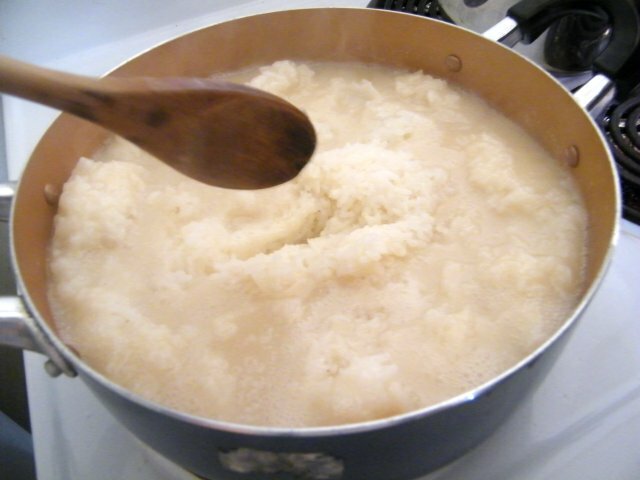 On a pot, the water will boil and would usually overflow a bit. This is your signal to remove the cover. Let it boil until the water is no longer visible. Cover and bring the heat to low for about half an hour or until cooked. 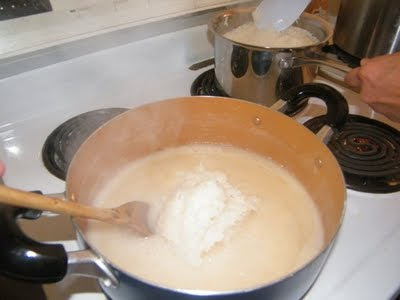 While the glutinous rice is cooking, pour the coconut milk in a separate pot and add the palm sugar. Bring to a boil over medium heat and mix until the palm sugar has fully dissolved. 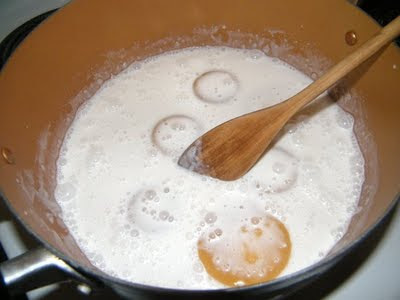 Next, transfer all the glutinous rice onto this coconut milk-sugar mixture. until all the coconut milk has been absorbed by the rice. Spread on a serving dish and spread the coconut strings on top. 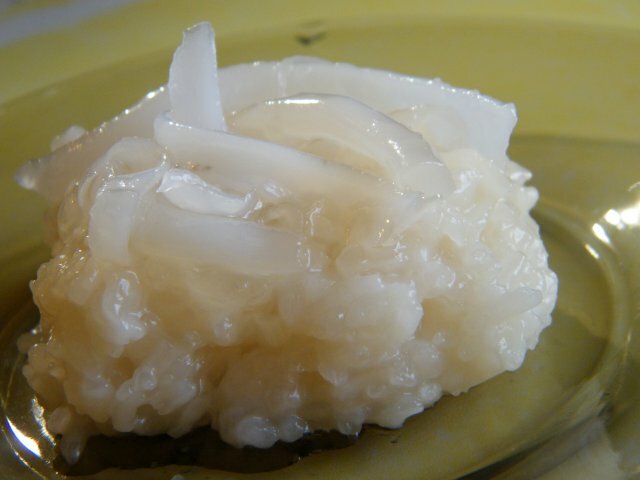 Let cool, at which stage the glutinous rice will become nice and sticky.